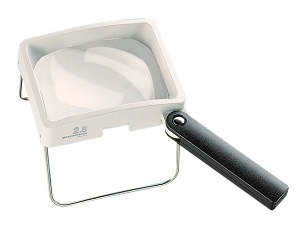 Can be used as a hand-held magnifier with fold-out handle. Can be used as a stand magnifier: fold-out metal feets enable the lens to be tilted for a comfortable viewing angle. Suitable for reading, writing and handicrafts. The practical all-rounder for multi-use. Supplied with a fine grain black leather case with soft inner lining to protect the lens. Display and Optoform equipment available. super-lite fluorescent light only suitable for use with item 2032.